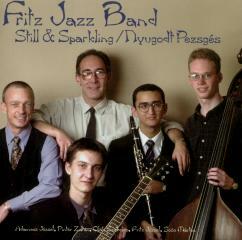 Right from the beginning, the band represents a musical style little known in Hungary, called swing. The clarinet, the tones and colours of the connecting registers play a leading role in the music. Joe Fritz playing on clarinet, is the founder of the band, while guitarist Szabolcs Oláh, bass player Márton Soós make up the core of the band. Now, with the affiliation of Zoltán Pintér (piano) and József Adamecz (drums) has reached group the level, where it is capable to make professional jazz sounds. This first album contains: Perdido (Juan Tizol – Duke Ellington), Cool Blues (Charlie Parker), Blues For Alice (Charlie Parker), Wendy (Paul Desmond), I Got Rhythm (George Gershwin), Bunko (Lennie Niehaus) and many more.